A replacement is reserved for the presidential administration head. 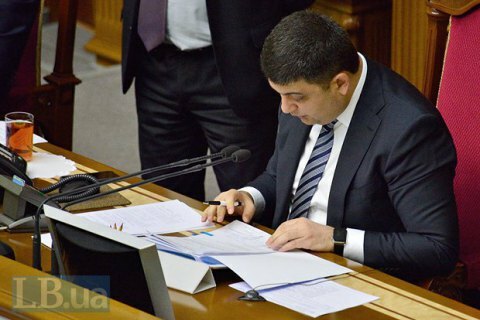 The presidential administration has drafted a new lineup of Volodymyr Hroysman's government in case the current parliament speaker is elected as prime minister. Judging by Vitaliy Kovalchuk's new potential post of the first deputy prime minister, this lineup is a raw version. According to information available to LB.ua, Hroysman does not mind having Kovalchuk as first deputy prime minister but only on condition that he is given no real power. - first deputy speaker Iryna Herashchenko. Oleh Lyashko's Radical Party will only enter the coalition if it is entitled to the speaker's post, to which the People's Front flatly objects. Incumbent Prime Minister Arseniy Yatsenyuk is waiting for President Petro Poroshenko to visit the USA on 30 March-1 April, where he expects him to be advised to preserve the current layout. Earlier, Hroysman also mentioned Deputy Economic Development Minister Maksym Nefyodov among people he would like to see in his team.